Below is the email we send to every new customer. By all means use your own words, but be sure to welcome your customer with something like this. You can also leave out the graph if you prefer (to shorten and simplify it). Welcome to the wonderful world of Juice Plus+! Your order has been processed and you should receive it in 5-7 days. We hope you come to love Juice Plus+ as much as we do. It’s reassuring to know that we’re putting 30 fruits, vegetables and grains into our bodies every single day, lowering our risk of disease, and improving our day-to-day health and vitality. 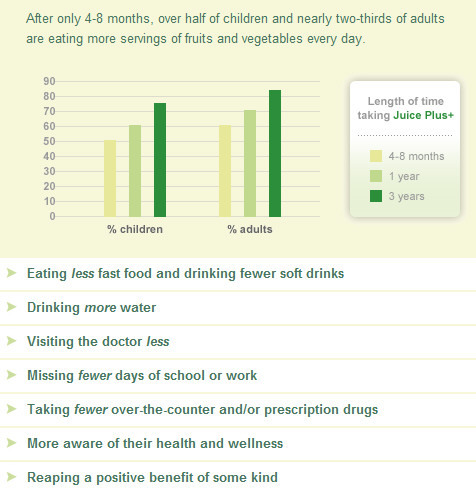 It is very important to take Juice Plus+ consistently, every day for at least 4 months. It takes 90-120 days for blood cells to be replaced with new, healthier cells. Many people notice results within a few weeks, some even after a few days. Most people, however, experience benefits after 3-4 months and even more improvements after a year or two; see the experience of 150,000 families in our Children’s Health Study. When is it best to take Juice Plus+? It really doesn’t matter. We suggest you start by taking ONE fruit capsule with a large glass of water at breakfast, and ONE vegetable capsule with a large glass of water at lunch or dinner. After 3-4 days, increase to the recommended 2 + 2 +2 capsules daily. If you have trouble remembering to take them, by all means take all four capsules at the same time. Here’s more expert advice from Dr. Mitra Ray. After 100 days, we will invite you to complete a short survey, which will help us identify what results you have seen from taking Juice Plus+. During the next 4 months, you will receive occasional emails from doctors giving you their insights concerning health, nutrition and the role of Juice Plus+; please make sure your email system accepts emails from juiceplus.com. If you haven’t yet heard what medical experts are saying about Juice Plus+, please watch the 10-min video below. If you have any questions, please don’t hesitate to contact us by email, or by phone.